The new muppet movie is, in the manner of THE BLUES BROTHERS, all about putting the band back together to play a benefit concert for a worthy cause - in this case, saving the old theatre from which the old beloved TV show used to be broadcast. The movie drips with an earnest nostalgia for the days when kids TV was about gentle humour, song-and-dance acts, with a healthy dollop of liberal "rainbow" politics thrown in. The Muppets was all about trying your best; accepting yourself for what you are; pulling together; and putting your friends first. 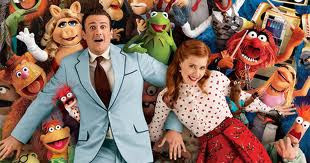 It's obvious from the goofy smile on his face, that Jason Segel - the star and key instigator of the movie - totally buys into the Muppet ethos. In a sense, he really is Walter, his character's muppet kid brother. How sad then, that instead of trusting to that earnest charm, Segel and screenwriter Nick Stoller (GULLIVER'S TRAVELS) decided NOT to play it straight. Rather, THE MUPPETS is a movie that constantly winks at the audience - it drips with post-modern ironic commentary on its core story and characters - knowingly pointing out through sight-gags and one-liners the hokiness of the genre. The result is a movie that wants us to believe that the world hasn't changed so much - that kids would still fall in love with the plain vanilla muppets franchise. On the other hand, it clearly doesn't believe this to be the case, and feels it has to go for a post-modern snarky "SHREK" style of children's movie-making. It rather smacks of trying to have it both ways. For all that, I still had a good time watching the flick. For sure, the first half is far too knowing - far too slow to build - far too reliant on commenting on its own montages and Chris Cooper saying "maniacal laugh" rather than actually laughing. But by the time you get to the telethon and we focus on the old fashioned muppet vaudeville show, the movie settles down. It's hard for anyone who grew up with the muppets not to enjoy seeing that famous intro, hearing the "rainbow connection" or just seeing Animal play the drums! And yes, you do leave the cinema singing "Am I am man or a muppet". That brings me to another point - the use of Brett McKenzie of FLIGHT OF THE CONCHORDS fame to write the songs. I'm a huge fan of CONCHORDS but I found the use of McKenzie distracting. Because as fun as it was to see Chris Cooper doing a rap pastiche; or Amy Adams doing a 70s disco pastiche; I just couldn't help but feel that it wasn't as fun as seeing McKenzie or Jermaine Clement doing the numbers. In particular, Clement should definitely have played the Cooper part. Anyway, all this griping is definitely not in the spirit of the muppets. Problem is, neither was this film half the time. Still, happy to see the old gang back on our screens. Let's hope the franchise gets reinvigorated - but hopefully on TV - it's proper and fitting format. THE MUPPETS was released last year in the USA, Canada, India, Mexico, Brazil, Israel, Singapore, Kuwait, Chile and Estonia. It was released earlier this year in New Zealand, Slovenia, Panama, Argentina, the Czech Republic, Hungary, Germany, Hong Kong, Bulgaria and Poland. IT goes on release on February 3rd in Italy, Spain and Portugal; on February 10th in the Netherlands, Denmark, Ireland and the UK; on February 17th in Belgium, Lithuania and Turkey; on March 16th in Sweden; on March 29th in Ukraine and on April 11th in France.